Diagnosing lameness and establishing the condition responsible calls for a complete locomotor examination. Your veterinary surgeon is the only person qualified to assess your horse's locomotor function, using a series of special examinations and diagnostic tests. From considering the horse's background to taking X-rays, also including a study of the horse as he moves, a consultation for lameness often takes a long time and is always broken down into several stages, which are absolutely essential to a precise diagnosis, on which effective treatment will depend. Local analgesia in which areas of the horse are nerve blocked (in the same way your dentist may numb or freeze your teeth) can be used to identify and confirm sites of lameness. Medical imaging techniques are often very useful in making a diagnosis. 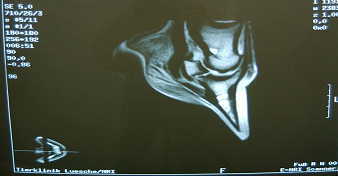 This essentially shows the bone structure in the area X-rayed. Studies will cover the conformation of the bone structures (looking for deformation or remodellingChange in the shape of the bone as compared with its normal shape: the contours of the bone are changed in an X-ray.) and the structure of the bone (looking for variations in bone density, sclerosisIncreased bone density: the area is whiter in an X-ray. or demineralisation, characteristic of remodellingChange in the shape of the bone as compared with its normal shape: the contours of the bone are changed in an X-ray.). 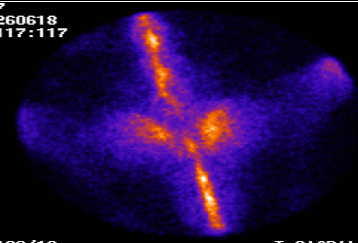 The X-ray image will be whiter if the structure studied is thick, dense and mineralised. Using a sensor that emits and receives waves, ultrasonography shows the soft tissueAny tissue that is not bone (tendon, muscles, vessels, nerves, etc.). : tendons, ligaments, capsule and contents of the joint, cartilageFibrous, elastic tissue covering the bone surfaces in a joint. It has a sliding and impact-absorbing function., together with the relief of the subchondral boneBony area situated just under the joint cartilage. Ultrasonography thus provides additional information to that provided by radiography. 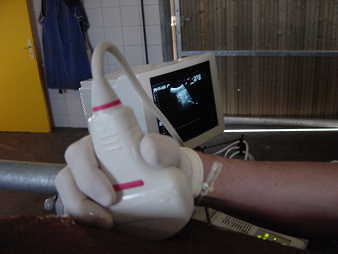 Ultrasonography is limited by the accessibility of the structure to be examined: structures situated under bone tissue, or inside the hoof, are inaccessible. Transrectal ultrasonography, traditionally reserved for gynaecological examinations in mares, can make it possible to see the major arteries feeding the back legs, together with the bony relief of the vertebrae or the pelvis, when checking for fractures or signs of osteoarthritisChronic inflammation with a degenerative process in a joint.. 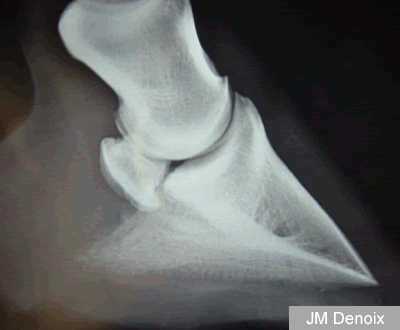 Unlike radiography and ultrasonography which can diagnose the type of damage responsible for lameness, scintigraphy is used to determine or confirm the site of the damage. It can be carried out in only a few centres in Europe, and is very useful in cases of less obvious lameness. The principle of scintigraphy is the injection of a slightly radioactive product into the patient's circulation, followed by measurement of the amount of radioactivity released by different areas of the horse's body using a gamma camera. The areas in which there is greater blood flow, together with the active areas of the skeleton (areas of remodellingChange in the shape of the bone as compared with its normal shape: the contours of the bone are changed in an X-ray.) release more intense and longer lasting radioactivity. Scintigraphy can be followed by classical radiography and ultrasonography, once the abnormal site has been identified. 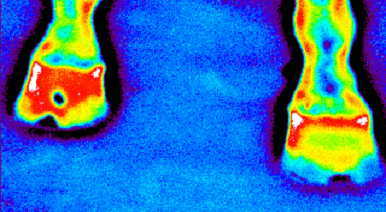 Using an infra-red camera, it is possible to detect the temperature in each part of the body. The colour image obtained shows temperature levels. Thermography can therefore detect an area of heat, on the back on in one of the legs, and therefore guide the practitioner towards a painful or damaged area, which can then be examined more closely. Using a camera fitted to a rigid cannula inserted into the joint cavity, this technique provides an actual image of the joint and cartilageFibrous, elastic tissue covering the bone surfaces in a joint. It has a sliding and impact-absorbing function. damage. ArthroscopyImaging technique making it possible to look inside a joint by inserting a camera into the joint cavity. is used in particular in surgery, in cases of osteochondrosisA DOD, a growth disorder that is manifested by damage to the cartilage and underlying bone., in order to extract a fragment of loose bone in the joint. For an MRI (magnetic resonance imaging) examination, the area concerned is subjected to an intense magnetic field. The black and white image obtained shows all the tissues: bone tissue and soft tissueAny tissue that is not bone (tendon, muscles, vessels, nerves, etc.). (ligaments and tendons, for example): all anatomical elements are represented. MRI is the preferred method for diagnosing foot injuries. However, there are very few centres in Europe that can offer this examination.